Preparation of an effective résumé, cover letters, references and support documents for traditional job sectors, as well as e-sectors. Role plays to prepare and practice telephone calls and job interviews. Errors common to job hunters which you should avoid. How to compete for advertised vacancies. How to prepare your wardrobe for each opportunity. 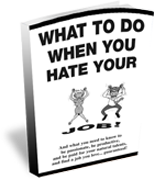 How to overcome rejection, put-offs or problems in your employment history. How to negotiate a job offer including benefits and salary. unlimited phone consultations of 15 min. or less to access my knowledge, experience and connections. unlimited email consultations Q & A sessions. 2 deliverables, e.g. résumé, approach letters, promo letters, scripts, etc.